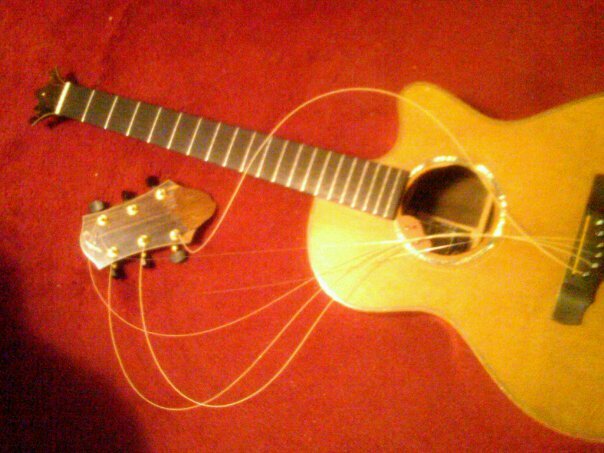 Here’s a brief update about the fate of my beloved, broken Ryan guitar. (See While My Guitar Gently Weeps.) 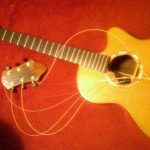 It’s funny how the blog I wrote about my guitar’s ill-fate got around. I was in Edmonton airport a few weeks ago, and after checking in the woman behind the counter, who had shown no sign of knowing who I was, leaned over and quietly asked if my guitar was going to be ok.
We weren’t initially sure if it could be repaired because in the shock of seeing my guitar on the ground with the headstock busted off – I failed to gather up all the smaller pieces of splintered wood. It wasn’t evident there would be enough contact for a glue repair to be strong enough to withhold the 140 lbs (I believe) of pressure six tuned strings put on a headstock. Bruce Jacobs (Jake), who did the repair, wasn’t overly confident it would hold. But… as it has turned out… the repair has worked, and Jake has set it up to play better than it ever has. Thank you all for your condolences. It was kinda nice that you all cared :). 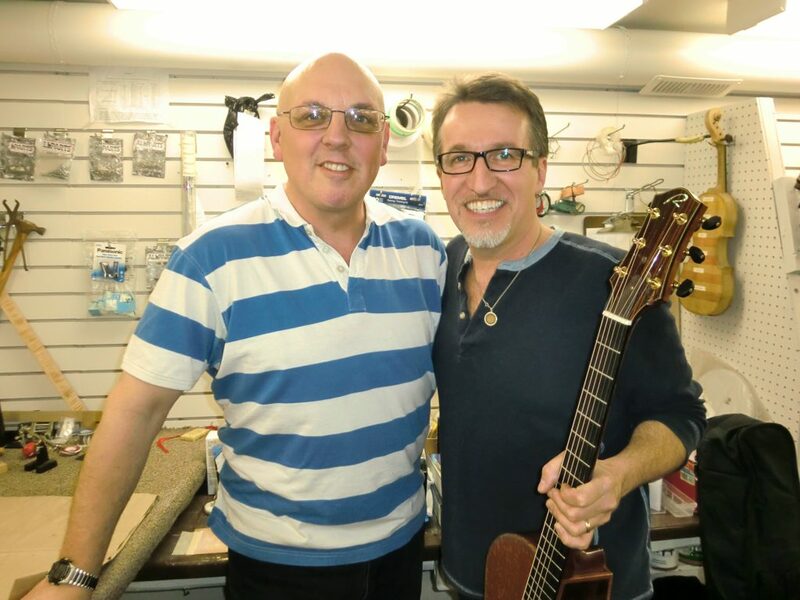 But in truth, I wasn’t (for long) concerned the guitar was completely lost as upon hearing about the damage, Kevin Ryan (the guitar’s maker) called to assure me that if the neck wasn’t repairable he would simply replace it. But all is well. The Ryan has another battle scar that I think is beautiful. I’m sure that when I finally retire her there will be not much left but that will be because she will have been so well spent – which is how I hope to end my days… utterly and well spent. Below is a pic of Jake (otherwise know as the guitar whisperer) and I with the wounded healer. If you want to see the before pictures and listen to a guitar instrumental that was written on and recorded by her click HERE. Well done Jake! This is a beautiful story…sniff. I forgot to ask if Jake can repair my air guitar? Not all that sure of the details. He had to build up some of the places where there was missing wood and then it was a straight glue. It is amazing what we go through to rescue our children and our partners…Glad to hear the guitar is back, and look forward to hearing it sing again soon. Peace. D.
I totally understand what it’s like to have something that you need to do for your profession break. I have had computers crash on me and be unrepairable, but thanks to the hard drives, I have been able to move on. Glad to hear that your guitar has been able to be repaired. God bless you. Thank you for sharing! Have a blessed tour! Steve! So good to hear that your friend is back in music-making condition! My McConnell acoustic is quite special. These guitars become partners, part of our voices, and they’re so unique. Hope to hear you (and your Ryan) soon! God bless your continued journey. Steve, last time I talked to you about guitars (In Edmonton at King’s College, the day after your Edmonton Symphony concert), it was all Stonebridge. Did you rebound to the Ryan before it crashed? I spent several hours last fall in Toronto’s The Twelfth Fret, playing 15 or 20 guitars, including a couple of Martins from the 30s/40s. The guitar I kept coming back to, and wound up walking away with, was a Chinese-made 00, going by a newly-resurrected name from the 30s, a Sears brand it was at that time–Recording King. Looking forward to seeing you and the band at the Winspear on Sunday. As strange as it may seem when you played Toronto last summer; sitting in my usual front row centre seat (always seems to be waiting for me no matter when I arrive), I had this freaky thought… One of these days Steve should invest in a real tree guitar stand as I hate to say…yes I had the horrible vision of Ryan’s poor headstock seperating from his wooden neck! The Pain of it all! As a player myself I am glad to hear Ryan has healed! Blessiings Always Steve…keep on keep-in on! So glad to know you two will be playing together again ! Fantastic work Jake – a true gift of God . Hurray for the Veveteen Rabbit….. well loved, well used, and more songs to come!